CD Digipack w/ 1 track sampler CD (Labels / EMI): 7243 8 42569 2 ? 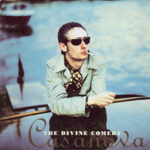 The French edition of Casanova is mainly different from the UK because the CD is red with the name of the artist on it in grey (uncoloured) and ‘Casanova’ written in golden letters, while the UK edition represents a rose. On the front cover the title ‘THE DIVINE COMEDY’ and ‘Casanova’ are written in gold, instead of being white (‘THE DIVINE COMEDY’) and golden (‘Casanova’) as on the UK edition. 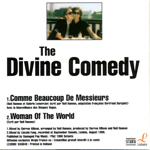 And, like the other French albums, we can see on the CD and on the back Labels’ logos and different serial numbers. 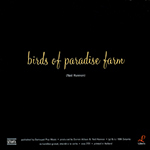 Some editions went with a Birds of Paradise Farm sampler CD and others with a Comme Beaucoup De Messieurs sampler CD. There exist some copies with a misprinted booklet: the lyrics of ‘Through A Long And Sleepless Night’, besides being in their right place, also appear at the beginning. Moreover, we can notice that on the front cover the band’s name is written in white, and the title of the album in golden characters, as on the UK edition. The digipack is a nice collector item. The sleeve is made to give a shape effect to Neil when it’s closed. Inside, the booklet is stuck on the sleeve in which the CD is inserted; this CD is different from the normal French release: it’s black this time, but the letters are written the same way (colours and font). The sleeve has a minor cutting difference to the normal French sleeve, You can look in the top-left corner to spot it. Under the sleeve we can read “Sleeve design by Jean-Louis Duralek” who has made a good looking job! The only problem with the digipack is that it seems each copies are torn in the bottom left hand corner, obviously due to a conception error. Along the CD comes a form looking like a CD to subscribe to Labels’ newsletter. There is a drawing of a mask on it. Indeed the first subscribers won a Casanova mask made by Labels. That actual Casanova mask actually exists and only a few must still exists nowadays. 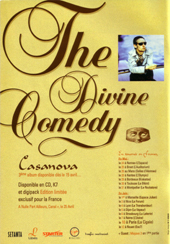 The CD was sold with Casanova during the promo of Comme Beaucoup De Messieurs. 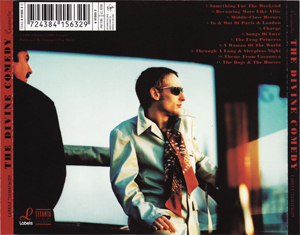 Like the Birds Of Paradise Farm CD, the sleeve has the Casanova picture on the front but with different colors and cutting; and the back has the credits and a photo of Neil Hannon and Valérie Lemercier. As Promenade, Labels released their own cassette version of the album. The booklet design is certainly based on the UK release although it has some minor differences. The common thing is that it is a 5 page folded cover, with the front having the titles within a black frame below the photo (although both are slightly bigger than the UK version’s front cover). The next pages have the album credit, and it ends with one of “Neil’s smoking his fag” photo. The other side has all the album lyrics printed in black on white. On the side the Setanta logo has been replaced by a catalogue number; and below the tracklisting the bar code is the standard EMI frame, and both Labels and Setanta logo are to be found on the left. The cassette itself has more interesting differences from the UK release. 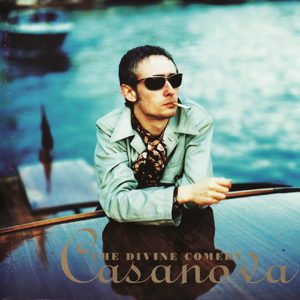 Instead of having the titles printed with a standard typeface, it a design similar as the album cover, same typefaces, and with The Divine Comedy printed above ‘asanova’, with re-adjusted size for that format. ℗ & © information, “made in Holland” and catalogue numbers are to be found just under. Copyright notes in French are also printed, and some logos: Setanta, Labels, bel BIEM. The LP is in fact the same as the UK edition which was redistributed in France. The only difference is that Labels added a sticker with the French bar code over the UK bar code. The CD is different from the British promo. Instead of being black, it’s not coloured and the printing is black, with a different font. We find the Virgin and Bel BIEM logos again but oddly no Labels logo. In the bottom, copyright notes appear in French. 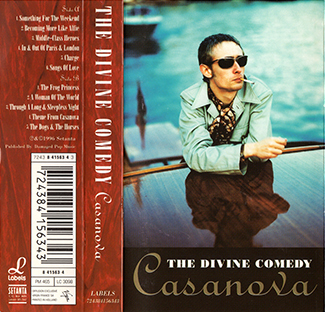 The tracklisting is cut up in an interesting way: on the top appear the first two tracks, the first two singles of the album; while the remaining tracks are on the bottom with ‘The Dogs And The Horses’ apart from the rest, reminding us of this being an epilogue to the album whose proper concept ends with ‘Theme From Casanova’. There are of course the usual mistakes in the names as it’s often the case on promos. Like so, ‘Middleclass Hereos’ instead of ‘Middle-Class Heroes’, ‘In & Out Of Paris’ (instead of ‘In & Out In Paris & London’, it’s a french promo for sure! ), ‘The Frog Princes’, and ‘The Dogs & Horses’ (instead of ‘The Dogs & The Horses’). The instore advert is quite original. It’s a mobile in two parts. The upper part shows a mask, while the second part advertises the album and live shows (event though no date is printed). On the left, logos of sponsors Bernard Lenoir and Les Inrockuptibles are printed, while on the right record companies Setanta and Labels are featured as well as Trafic Restreint, the French tour promoter of the band. There were two order vouchers for the Casanova album. A first pre-order was available before the release date in March/April 1996. It was possible to order the regular album or the digipack version. Later another voucher was published, probably because of the huge success, to order the complete back catalogue.